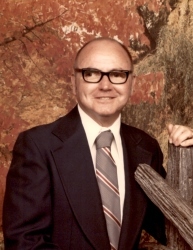 Vernon A. Ivey age 92 of Brooks, Georgia, passed away Tuesday, November 6, 2018. Mr. Ivey was born in Dothan, Alabama on August 16, 1926. He is preceded in death by his parents, A. G. Ivey and Esther Strickland Ivey; wife, Addie Hunt Ivey. Vernon retired from Sherwin Williams. He loved to spend time with his family and friends. Survivors include his sons, Terry Ivey and wife Martha, Larry Ivey and wife Wanda; 5 grandchildren; 10 great-grandchildren; many nieces, nephews and extended family. Visitation for Vernon A. Ivey will be Thursday, November 8, 2018 from 6:00 pm until 8:00 pm at Conner-Westbury Funeral Home. A funeral service will be Friday November 9, 2018 at 2:00 pm in the Chapel of Conner-Westbury Funeral Home. Dr. Bud Gleaton will officiate. Interment will follow in Brooks Memorial Gardens. In lieu of flowers, the family requests donations to Eternal Hope Hospice, 123 N 18th St, Griffin, GA 30223.